And so we begin a new year. A time to reflect. I have been reflecting on my activities for CSEdWeek. Since the first CSEdWeek in December 2009, I have celebrated the week on my campus trying different activities each year. For the first CSEdWeek in 2009, I was able to arrange for an after school walking field trip to a nearby business, Hydraflow. It was exciting to see the expressions on my students’ faces as they toured the business and listened to how the company had gone completely paperless! For the CSEdWeek in 2010, I wanted to do more! I was able to arrange for a walking field trip to Raytheon during the school day. The students were amazed at the “trailer” where equipment was set up to demonstrate a disaster and how Raytheon had built a system where different law enforcement agencies could “talk” to each other even though they were using various type of hardware. A parent from my school also graciously arranged for some employees from his company to speak to my students about how computer science had opened up opportunities for them. For CSEdWeek 2011 the students once again had the opportunity to tour Raytheon and visit the “trailer” again as well as the outdoor mock-up of a toll system. I also arranged for a student ambassador from University of California, Irvine to visit the class and discuss his experiences as a computer science student in college. For CSEdWeek 2012, I had asked the school board for my district to recognized CSEdWeek. They agreed to do that and I was asked to select two students to be honored at a board meeting. It was a difficult decision to only select two, but I was happy that I could have these students recognized! Raytheon tour was also a highlight of the week. The students appreciated meeting the wife of one of the school’s science teachers during the Raytheon tour. Additionally, one of my former students dropped by school and spoke to the students about her career working in the CS Field. Last year we celebrate Hour of Code during CSEdWeek. The local community college assisted with advertising for our community event. There were about 30 community members that attended the event with the computer science students assisting them. Several students commented to me about how much they enjoyed helping others to learn to code. 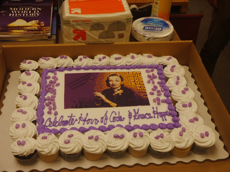 I also held a lunch time birthday party for the students at the high school to celebrate Grace Hopper’s birthday. The school board also recognized CSEdWeek and I selected two students to be recognized. In addition to the successful Hour of Code event, the students were able to connect with a Skype employee through Skype in the Classroom program. You can set up a session at https://education.skype.com/. The speakers were great and very patient answering the students’ questions. The district school board also celebrated CSEd Week at the school board meeting. This year I was able to select three students to be honored. The school principal took picture of the event and uploaded them to the school’s Facebook page. The week ended with a birthday celebration at lunch. 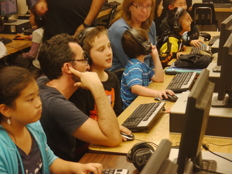 All students were invited and the CS students served cake and assisted the students with Hour of Code activities. I am looking ahead to next year’s CSEd Week. I plan to hold the community Hour of Code event in the library which the principal has already agreed to. I hope to add a Maker Faire with the help of the Engineering Classes. I will contact the principals at the local elementary and junior high schools to advertise the event and I will use Eventbrite again. Through Eventbrite, I have sent out a survey to this year’s attendees to evaluate and improve the Hour of Code event next year. What did you plan for CS Week that was a success? I am looking for more activities to add to the week! 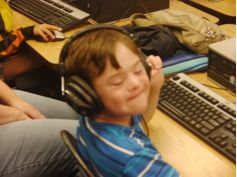 This entry was posted in Advocacy, Events, Teaching Methods by Myra Deister. Bookmark the permalink. Myra Deister earned a bachelors degree from Cal State Long Beach with a major in mathematics and a minor in business education. Additionally, she has earned masters degrees in Software Engineering from National University and education and mathematics from Cal State Fullerton. She has taught junior high, high school and community college mathematics and computer science in both the Garden Grove, Fullerton Joint Union High School Districts and North Orange County Community College District. Her course load includes AP Computer Science A, Computer Science AB, Fundamentals of Programming and Pre-Calculus. She is actively involved with Computer Science Teachers Association (CSTA) and serves on their Board of Directors. She also serves as a member of the board of directors for Orange County Computer Using Educators (OCCUE). Currently she is serving as the adviser for Sunny Hills High School Orange County Academic Decathlon team.